LIMA (Reuters) – Mexico on Friday called on its peers to refrain from interfering in Venezuela’s internal affairs, declining to back a regional declaration that urged Venezuelan President Nicolas Maduro not to take office on Jan. 10. Mexico was the sole country in the 14-member Lima Group that opted not to sign a statement critical of Maduro, the first time Mexico has not backed a declaration by the group since it was created in 2017 to push for democratic reforms in Venezuela. Mexico was once among the most outspoken critics of Maduro. But ties with Venezuela have warmed under leftist President Andres Manuel Lopez Obrador, who invited Maduro to his inauguration last month. Maximiliano Reyes, Mexico’s deputy foreign minister responsible for Latin America, said Mexico was concerned about the “situation regarding human rights” in Venezuela but would not comment on the legitimacy of its government. Instead, he asked the Lima Group to rethink its approach. “We call for reflection in the Lima Group about the consequences for Venezuelans of measures that seek to interfere in internal affairs,” Reyes said in a statement following a Lima Group meeting in Peru. “Mexico believes the most effective way to achieve the objectives for which this group was created is through mediation and dialogue, not isolation,” he added. The comments were a blow to regional efforts to ramp up pressure on Maduro ahead of his inauguration, which Venezuela’s opposition hoped would be a watershed moment to highlight how he has undermined democracy and mismanaged the country’s once-booming economy. But diplomatic measures from neighboring countries remain timid, and Friday’s communique added little to previous statements that urged Maduro to step down but offered few concrete mechanisms to make this happen. Peru said last month that it would propose ending diplomatic relations with Venezuela to Lima Group members. But no country has yet announced it would sever ties with Caracas. 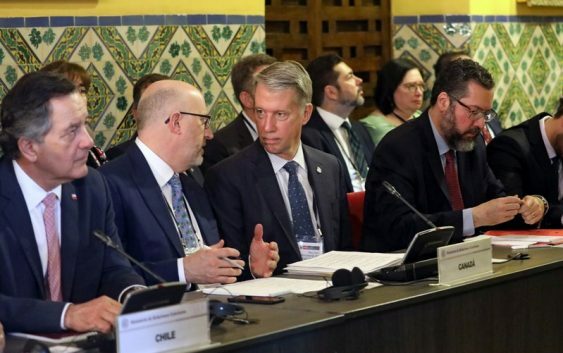 The 13 remaining countries in the Lima Group that signed Friday’s statement, which include Canada, Argentina, Brazil, Chile and Colombia, called Maduro’s new term “illegitimate” and urged him to hand power over to the National Assembly until democratic elections can be held. They also said they would seek to bar high-ranking Venezuelan officials from entering their territory or accessing their financial systems. “What’s happening January 10 is a turning point,” Peruvian Foreign Minister Nestor Popolizio told journalists. Venezuela’s foreign ministry did not immediately respond to requests for comment. What’s closed during the partial government shutdown?